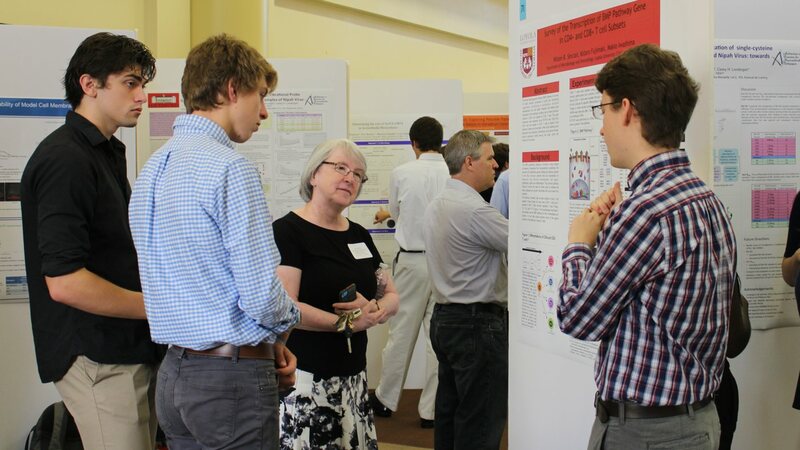 Every year, the KINSC hosts a fall research symposium showcasing the summer work of students from Haverford, Bryn Mawr, Swarthmore, and other area colleges. The 15th annual UNDERGRADUATE SCIENCE RESEARCH SYMPOSIUM will be held in the Koshland Integrated Natural Sciences Center (KINSC) at Haverford College on Saturday, September 28, 2019. Students and faculty from the departments of Astronomy, Biology, Chemistry, Computer Science, Engineering, Geology (Geoscience), Mathematics, Physics, and Psychology from Bryn Mawr, Dickinson, Franklin and Marshall, Gettysburg, Haverford, Swarthmore, and Ursinus Colleges are invited, and students will present posters of their summer research work. Each student planning to attend (whether presenting or not) should should complete the online registration form. If you are presenting a poster with another student (or group of students), please make sure to indicate this on your registration form. This year we plan to have four students present their work as a short talk rather than a poster. The KINSC Steering Committee at Haverford will select students for oral presentations based on their research abstracts. If you would like to be considered as one of the student speakers, you must register early (by September 10th) and indicate your interest to give a talk on your registration form. Student speakers will be selected during the week of September 10th. Each faculty member attending should complete this registration form. Posters must fit on the 4' x 8' boards provided, and the recommended size for each poster is 42 x 42 inches or 40 x 40 inches. Students may affix 8 1/2 x 11 inch pages individually onto separate poster board pieces or posters can be printed on one large sheet (but be sure it fits within the poster board dimensions). Your poster should provide information about your research project, including Title, Author, Abstract, Introduction or Background Information, Methods, Results, Discussion, References and Acknowledgments. Please bear in mind that a poster presentation is a visual experience. Please use large type (around 20 pt.) and try to keep your Methods section relatively short, about 1-2 pages long. Use diagrams, tables, and graphs in your poster. Haverford students should refer to the KINSC poster printing information page. For assistance or more information contact Marielle Latrick (mlatrick@haverford.edu) at Haverford College.